Craft practices can define cultures. In this case, craft practices will define Meșteshukar BoutiQ. 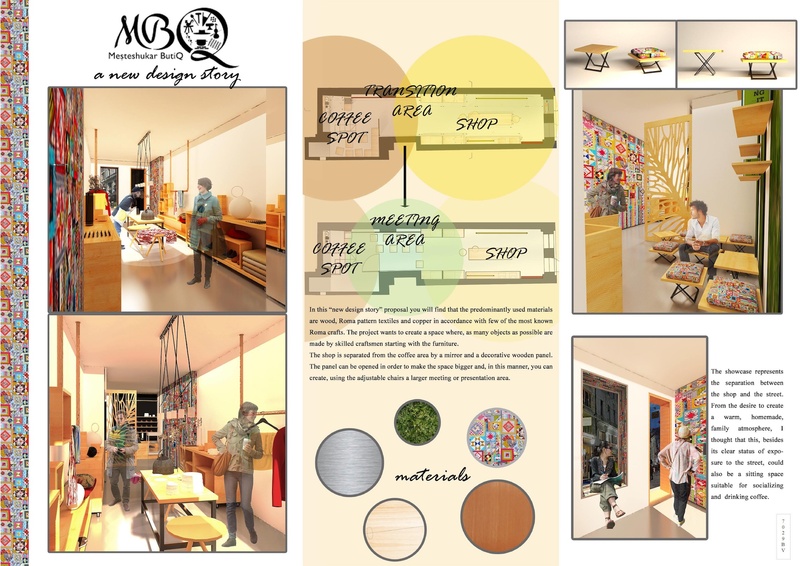 In this “new design story” proposal you will find that the predominantly used materials are wood, Roma pattern textiles and copper in accordance with few of the most known Roma crafts. The project wants to create a space where, as many objects as possible are made by skilled craftsmen starting with the furniture. The Shop Area – which is in the front of the space, in this way being the first interface with the customer. It consists by wooden pieces of furniture for displaying the jewelry, small accessories, kitchen items and home décor, and two copper bars, that are fixed in the ceiling for clothes and fashion accessories. All the pieces of furniture intended for the display of products are mobile, with wheels mounted. The Coffee Spot – situated in the back of the space, consist of a small serving area that can contain all the equipment requested: espresso machine, coffee grinder, pitcher rinser ,a showcase in the serving area for cakes and biscuits, two mini fridges in the lower back part of the preparation area. height. They can be disposed in anyway the customers want. coffee spot. The shop is separated from the coffee area by a mirror and a decorative wooden panel. The panel can be opened in order to make the space bigger and, in this manner, you can create, using the adjustable chairs a larger meeting or presentation area. 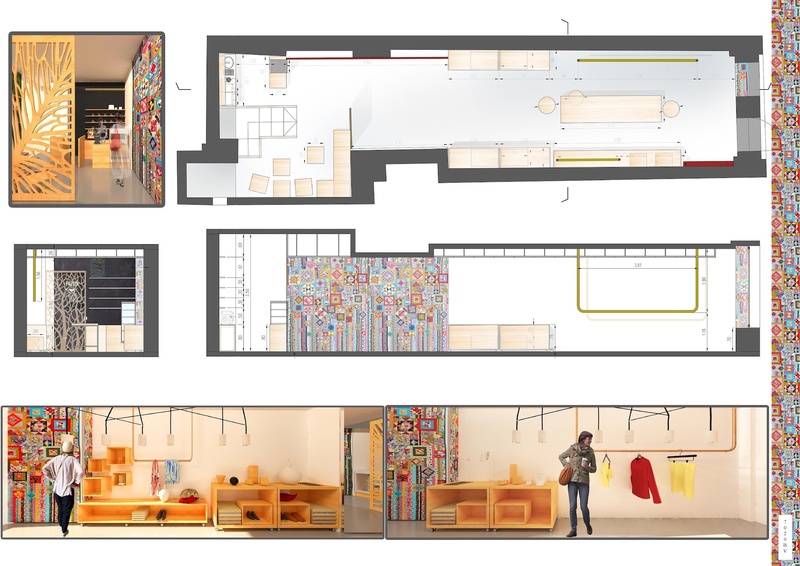 This proposal wants to bring a part of Roma culture into this shop, and in the same time, wants to offer a modern atmosphere to its customers.